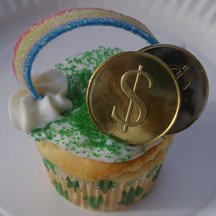 What You Need: 1 cupcake; white frosting; green sugar sprinkles (or use green frosting); metal star tip and pastry bag (or snip end of plastic sandwich bag); Airheads Extreme sour belt; chocolate or plastic coins. How to Make It: Frost cupcake. Sprinkle with green sugar. 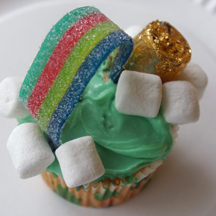 Use star tip to make two clouds on either side of the cupcake. Arrange rainbow candy to arch between the two clouds. Add coins to one end. 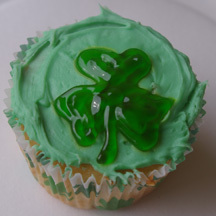 You can easily draw a shamrock to make a St. Patrick’s Day cupcake, thanks to gel icing in a tube! What You Need: 1 cupcake; green frosting; green gel writing icing. How to Make It: Frost cupcake green. Use tube to “draw” clover shape. First, draw the outline and then fill in with gel. 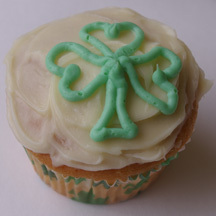 All you need is some green icing to draw some hearts and create a clover shape. Don’t worry if you don’t have a pastry bag and metal tip. You can do the same thing with icing in a tube (“writing icing”) or even frosting in a plastic baggie with the tip snipped off. What You Need: 1 cupcake; white or off-white frosting; green frosting; pastry bag and metal tip #2 or one of the alternatives explained above. How to Make It: Frost cupcake with white icing. Using the materials described above, pipe or “draw” three hearts arranged in a clover shape. Then add a stem. What You Need: 1 cupcake; white or off-white frosting; 3 candy hearts (Necco, etc.) 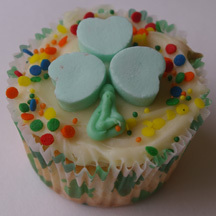 or four if you want a four-leaf clover; green writing icing with round metal tip or icing in tube; rainbow sprinkles. How to Make It: Frost cupcake. Arrange hearts in clover shape. Use green icing to “draw” a stem (optional). Sprinkle rim with rainbow sprinkles. 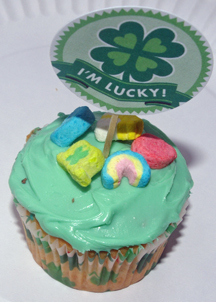 For St. Patrick’s Day or anytime you need a bit of good luck, make these easy cupcakes with Lucky Charms cereal on top. They’re magically delicious! 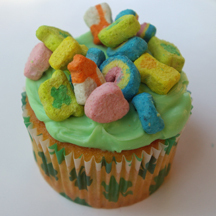 What You Need: 1 cupcake; green frosting; marshmallow shapes from Lucky Charms cereal. How to Make It: Frost cupcake. Add Lucky Charms cereal. that’s it!